Whether you're looking for your first desktop vaporizer or want to add a new desktop vaporizer to your collection without investing a lot of money, the Easy Vape Digital Vaporizer is one of the best vaporizers available in its economical price range and will provide you with years of enjoyable vaping. 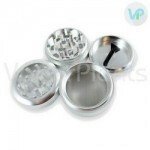 The Easy Vape Digital Vaporizer is a whip vaporizer that can be used with all dry herbal blends. 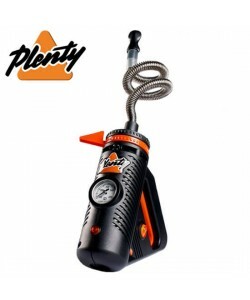 The Easy Vape name refers to the simplistic design of the vaporizer, which makes it an ideal whip vape for beginners. Nearly every Easy Vape review is packed with praise for the desktop vaporizer, testifying to its good vapor quality and ease of use. With the Easy Vape Digital Vaporizer, it's easy to achieve the ideal vaporization conditions for nearly all types of dry herbs. The Easy Vape features an LCD screen that tells you the exact temperature setting. Twist the knob to raise or lower the temperature by 2-degree increments to reach the ideal setting from 200 degrees Fahrenheit to 400 degrees Fahrenheit. Even at the highest setting, the whip vaporizer will reach optimal temperature in 2 minutes or less. Measuring 4.75 inches by 3.63 inches by 6 inches in size, the Easy Vape Digital Vaporizer weighs around 1 pound. Its lightweight design is owed largely to its polycarbonate housing, which keeps the weight light while still making the desktop very durable. 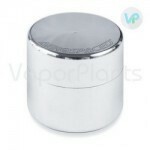 The attractive tabletop vaporizer is made in six colors: Black, Red, Blue, Silver, White and Yellow. The internal components of the Easy Vape Digital are as impressive as its stylish exterior. The dry herb vaporizer features a ceramic heating element and glass on glass components instead of metal and plastic parts. This ensures a toxin-free, impurity-free vape with every draw. To help prevent serious damage in the event of a power surge, it features fuses that you can simply replace in the event of a short circuit. The high quality construction of the dry herb vaporizer allows the Easy Vape to bear a 5-year manufacturer's warranty. With the Easy Vape Digital, you'll receive a whip that changes colors as you draw. Ground glass connections allow the whip to stay inside of the vaporizer without you having to hold on, keeping your hands free. The included whip consists of an 18-millimeter glass wand, 2.5 feet of surgical grade silicone tubing and a shatter-resistant Pyrex glass mouthpiece. This is my first desktop vaporizer I use the portable ones in the past but they just don't last and they're not rugged they don't handle too much abuse now this desktop vaporizer is definitely what I've been looking for for a long time and the price is excellent the only thing I don't like about this vaporizer his the ball is way too big meaning in order to fill it up you'll go through 3 grams for each session but it's an easy fix all you have to do is take the screen out of the stem and reposition it farther up on the stem this way you can regulate between 0.5 G and 1 gram. Temperature settings that work best are between 280 and 290 degrees the heating system works excellent within 10 minutes and I thought since the dry herb vaporizer is a healthy alternative that it'll actually make the potency less extreme but I was mistaken by cutting out 80% of the carcinogens that you don't need it actually increases the potency and you could take the used dry herb and recycled it for Edibles instead of throwing it away one of the best purchases I've ever had fast shipping and really fair price these guys are very professional at Vapor plants.com I did notice when I order from the website the address comes out of Brooklyn New York City but when the package was delivered to me it came out of California so I guess Warehouse locations are different than the actual online purchase but shipping was still fast regardless I will continue to keep buying devices from this company because they're extremely impeccable I should have bought my portable dry herb vaporizer from this company instead of buying from retail trial and error lesson learned but I would recommend this device to anybody that cares about their health and doesn't want to destroy their lungs because any burning ingredient that you're inhaling in your lungs is bad for you. Best temperatures - Review by Sanford C.
The Easy Vape Digital is great. It is best at a starting temperature of around 220 degrees Fahrenheit and worked up to around 280 slowly over time to keep up with the consistency in vapor. I like to let it heat for around 10 minutes at a time before I use it. I also store it in the box that it came in. Best at 290 degrees - Review by Valerie J.
I am new to vaping as a whole and have found that the Easy Vape Digital is the best vape for me. I wanted something that I could use at home and this thing delivers. It is ready to use in only minutes and the results are incredible especially when compared to smoking to get the same effect. I get the best vapor at around 290 degrees Fahrenheit when I use the digital thermometer. I would recommend - Review by Larry G.
I find that the Easy Vape Digital is really easy to use and is quite efficient. I do not have anything negative to say. The price and the quality of the Easy Vape Digital is outstanding and the quick heat up time is great. I was worried that I would not know how to use it but it all came rather naturally to me. I would recommend this to both beginners and advanced users alike. Great vape - Review by Anthony H.
The temperature control settings on the Easy Vape Digital really make all of the difference in the world. I like playing around with it and finding the sweet spot with each new kind of material I am using inside of it. I never get tired of using it and I have had it for a few years now. Really great vape that I would recommend to absolutely anyone. Great desk vaporizer - Review by Paul S.
The Easy Vape Digital is one of the best purchases I have ever made. It is a great desk vape and I could not be happier. Happy customer - Review by Krista J.
I loved the price and the reviews of the Easy Vape Digital, so I bought one and I am so happy I did. It heats up in no time at all and makes my material stretch out. Great price - Review by Stephanie J. It can be tricky finding the right temperature for the Easy Vape Digital to be used at, at first, but once I did I was happy. I think it comes at a great price and is an excellent unit for me to use daily. Big bowl capacity - Review by Lester P.
This is one of the best things that money can buy. It has a really big bowl capacity and seems to go on forever. I also like that it heats up fast and is easy to adjust. Fun unit - Review by Johnathan V.
Playing with the temperature settings of the Easy Vape Digital is almost as much fun as using it itself. 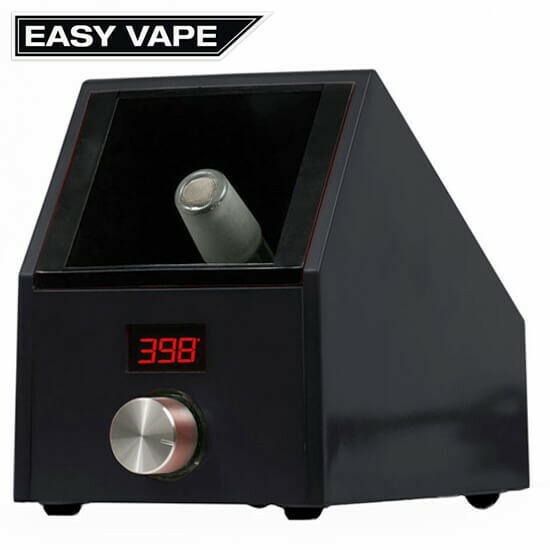 There is nothing bad to say about the Easy Vape Digital. Happy with my purchase - Review by Elizabeth D.
I read a lot of reviews before settling on this piece. The good reviews were absolutely right about this thing. I could not be happier with my purchase. I would buy it again and I would recommend it to anyone who asked me. Combusts the herbs in the low 300's, completely uneven heating.